It’s easy to miss so much in the news these days. Stories that would have dominated headlines for weeks a generation ago, barely make a blip on the 24-hour news cycles of corporate media. So, we wanted to take a moment to highlight two important stories that continue to remain under the media radar, but yet offer glimpses of hope. Not everyone is paralyzed by the overwhelming world in which we find ourselves. As we take a turn toward the second half of 2018 and head for November 6, 2018 (the day we can triage the wounds and stop the bleeding), we wanted you to know – there are individuals/movements that have gone past the paralysis that seems to be gripping us as a nation. We have the power to change things. Below are a small reminder of some who are trying. 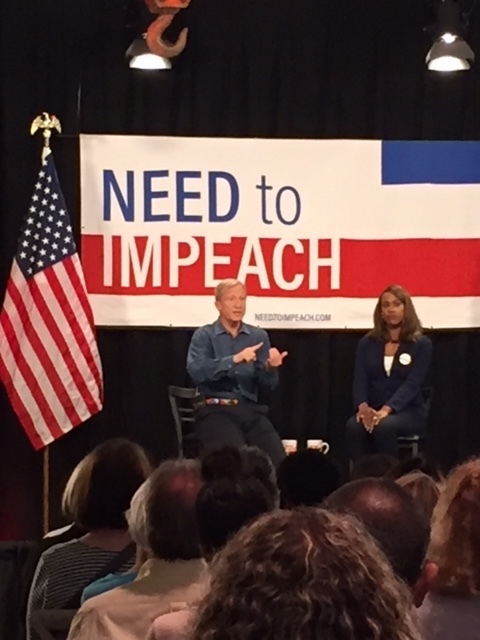 Tom Steyer and the ‘Need to Impeach’ petition drive is making stops all across the country. “When we started this petition drive last October, we knew things would only get worse. We knew there would be events that would happen that would make our case for us. In October, Mr. (Robert) Mueller had not indicted anyone. No one had pled guilty. Then, two weeks ago, the Trump Organization took $500 million from the Chinese government. So, what we’ve seen is a continued deterioration of the rule of law. To outburst of loud applause, Steyer said, “We are going to tell the truth…and second, we are going to put the American people and American Democracy above anything else. When people say it’s not politically expedient to tell the truth…we’re going to ignore them. Don’t say there’s nothing you can do right now. This is one small step that can help push forward the “need to impeach” this lawless, reckless, and dangerous president. Our political conversation has lacked many things over the past decades. None more obvious than the inclusion of a moral narrative. That’s been changing since the launch of the Poor People’s Campaign: A National Call for Moral Revival on Mother’s Day, May 14. 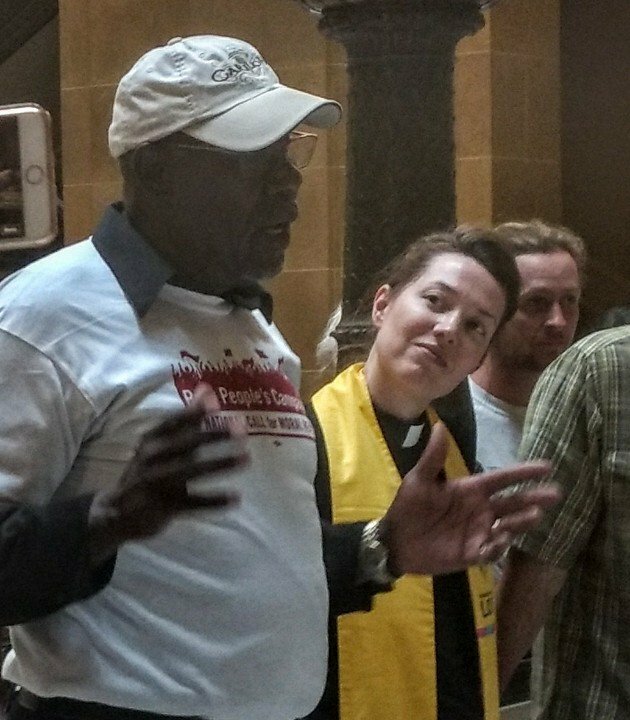 The Poor People’s Campaign is the nonviolent social change movement aimed at the reviving the core components of Dr. Martin Luther King, Jr’s message of nearly 50 years ago. That is, the oppression of the interconnected triple evils of poverty, racism, and militarism. 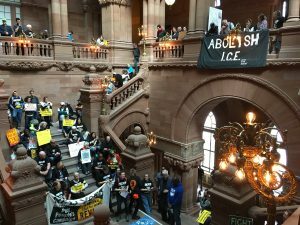 Or this recent group in Albany, NY demanding healthcare and a healthy planet for all. In New York, the Poor People’s Campaign advocated for healthcare and clean air for all. Hundreds have been arrested across the country (New York, Washington, Kentucky, Missouri, Iowa, California) and many more events and protests are planned for the rest of June. You don’t have to be arrested, but you can be aware of what’s going on and support the Campaign’s efforts. To find an event near you, click here. Co-directors of this protest movement are the Dr. William Barber and Rev. Dr. Liz Theoharis. Dr. Barber is a longtime civil-rights activist, and president of the North Carolina NAACP. He is the co-author of The Third Reconstruction: Moral Mondays, Fusion Politics, and the Rise of a New Justice Movement. You can read more on Rev. Barber by clicking here. Rev. Theoharis is the co-director of the Kairos Center for Religions, Rights, and Social Justice. She has worked as an organizer with people in poverty for the past two decades, collaborating with groups such as the National Union of the Homeless, the National Welfare Rights Union, and the Coalition of Immokalee Workers. To read more about Dr. Theoharis, click here. War rages; plastics are killing our oceans; climate change threatens our very existence. Overwhelming? Yes. Impossible to change? No. But it takes action. What are you doing today to try and stop the insanity? We can’t all be Tom Steyer or found a Poor People’s Campaign, or be the students from Marjory Stoneman Douglas high school (who are now embarking on a national summer tour to register young voters). But we can each do something. Speak up (to friends, family, legislators). Sign petitions. Support events in your area. Don’t become apathetic. Learn how our government functions. Vote…even when it seems the system is under attack. We cannot give up. As Howard Zinn (above quote) reminds us: The power at the top is indeed very fragile when we stand up to the bullies. This entry was posted in Campaign Finance Reform, Citizens United, Democracy, FEATURED, Religion and Politics, Social Justice and tagged Democracy, impeach, Poor People's Campaign, Social Justice, Tom Steyer. Bookmark the permalink.